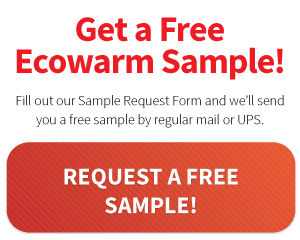 Ecowarm RadiantBoard is committed to being the greenest and most sustainable radiant board product in the United States. Indeed, it can be reasonably said Ecowarm RadiantBoard is currently the only radiant board product in the market that can be fairly described as truly green. We use No VOC water-based adhesives in the manufacturing of our product. This makes a healthy product for both our customers and workers. Aluminum is 1500 times as conductive as wood so we use it responsibly to improve the heat transfer in our product. We use U.S. made aluminum with recycled content. Sustainability also determines the thickness of the aluminum in our product. We have engineered the thermodynamically appropriate thickness of aluminum into our product to transfer energy efficiently and save energy but not so thick as to be wasteful of our aluminum resources. These are not just marketing words…To get beyond the green clichés and understand what is important about our FSC certification please watch the wonderful video the Forest Stewardship Council just put out about what they do through the eyes of our children. Our website host through the Bonneville Environmental Foundation purchases 200% of their energy needs from renewable wind and geothermal energy projects in our local power grid. Unlike traditional carbon offset or national renewable energy credit programs, this method directly benefits the data facility and the Pacific Northwest environment and economy.